In recent years there have been numerous examples of the tenacity with which Chinese buyers track down outstanding examples of their heritage in small auction rooms around the world. That Bordeaux result had echoes of the €22.1 million, bid in Toulouse in 2011 for a Qianlong-era scroll painting or the even more extraordinary $83 million bid, but never paid, for a similar period vase at a 2010 auction in Ruislip in West London. More recently, President Xi Jinping’s crackdown on corruption and the slowing of China’s economy have cooled demand, particularly for more routine objects that have been restored or overvalued. And yet Chinese decorative art and antiques was one of the few auction sectors that grew in 2015, according to the Netherlands-based European Fine Art Foundation, or Tefaf, whose annual art market report was published on March 9. Auctions of Chinese porcelain, jades, furniture and other antiques fractionally increased year-on-year from $2.1 billion in 2014 to $2.2 billion. Though this is still far below the heights of the $3.4 billion generated in 2011, the sector nonetheless “performed significantly better in terms of annual growth than fine art in China and many other countries,” the report says. The strengths and weaknesses of the market for historic Chinese art were evident this month at the annual Asia Week New York promotion, which ran from March 10 to 19. The event, whose eighth edition featured 45 galleries and five auction houses, achieved a total of $130 million in sales, the organizers said. Last year, Asia Week raised $360 million, thanks to a $131.7 million boost from Christie’s blockbuster sale of the collection of the dealer Robert Hatfield Ellsworth. Perhaps more significantly, this year’s total was also well down from the $200 million the event achieved in 2014. The seizure by federal officials of more than half a dozen Southeast Asian artifacts from the promotion, which the authorities said had been looted, generated some unhelpful publicity , but plenty of Chinese buyers did fly to New York for the event, and dealers and auction houses made sales. “Mainland Chinese are in a more cautious and selective mood now,” said James Lally, a participating New York dealer, whose exhibition of ancient Chinese jades nonetheless found buyers for 62 out of its 75 pieces, ranging in price from $5,000 to $500,000. “Yet China is creating new collectors every day, and when a mainland Chinese begins collecting, he always collects Chinese art.” He added that about 40 percent of the sales at his show went to buyers from greater China. Credit“Mainland Chinese are in a more cautious and selective mood now,” said James Lally, a participating New York dealer, whose exhibition of ancient Chinese jades nonetheless found buyers for 62 out of its 75 pieces, ranging in price from $5,000 to $500,000. “Yet China is creating new collectors every day, and when a mainland Chinese begins collecting, he always collects Chinese art.” He added that about 40 percent of the sales at his show went to buyers from greater China. The Tefaf report calculates that 82 percent of the value of last year’s auction sales of Chinese decorative arts and antiques took place in China. That percentage is set to rise in 2016 as Western sellers increasingly choose to offer their finest pieces in Hong Kong rather than New York or London. Descendants of the mid-20th century British collector Roger Pilkington, for example, have chosen to sell all 100 lots of his Chinese ceramics on April 6 at Sotheby’s Hong Kong. The auction is estimated to raise at least $29 million. Wealthy Westerners, if they do buy Chinese art, now tend to buy the art of today. Many are banking on it being a lucrative investment once China produces its hoped-for boom in contemporary art collecting. The world’s museums continue, by and large, to regard the best Chinese Neolithic jades, Tang dynasty pottery figures and Ming dynasty bronzes as among the timeless achievements of human civilization. And the new wealth of China still values this heritage and is prepared to pay for it. China is growing its presence in the global art market at a time when sales are under pressure. A new report by UBS shows worldwide sales of art and antiques fell 1% in 2016 to just over $55 billion, compounding a slide of 7% in the prior year. But China, the world’s third-largest maker for art, saw its share of the market increase slightly, despite a 2% decline in transactions. That was due to bigger falls in the U.S. and U.K. Art purchases in the Middle Kingdom are holding up better than other big markets despite a substantial slide in the yuan versus the U.S. dollar and new restrictions on taking money out of the country. Industry experts say the Chinese art market continues to evolve. Catherine Kwai has run the Kwai Fung Hin art gallery in Hong Kong’s Central district for more than 20 years and has watched the big changes in how Chinese consume art. “When the economy was booming, they would buy anything. They wouldn’t know the artist’s background, or maybe even their name,” she recalls. But times have changed. Kwai says the market is “much more sophisticated now,” and Chinese collectors have become much more discerning in the art they acquire. “When they buy things they come with advisors - they study the artist’s background,” Kwai says. 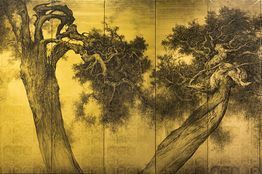 Li Huayi, the artist Kwai is exhibiting at Art Basel Hong Kong, has a background worth studying. Shanghai-born Li started out painting propaganda during the Cultural Revolution, before moving to San Francisco in the 1980s. His large landscape paintings blend Chinese traditionalism with modern, American abstraction. Over the past 10 years, the Chinese art market has seen both tremendous growth and volatilities as it reached a size large enough to majorly impact the global art auction market. At the same time, the overseas sales of Chinese art has also more than quadrupled since 2009, with an unexpectedly strong growth in 2015 even as the mainland China market went through a cooling period. Together, the global sales of Chinese art accounted for almost a third of the global art auction market in 2015. 1. The total sales value in mainland China continued to decline in 2015 ($4.4 billion, or down 19% from 2014), reaching under its 2012 low. 2. The number of auction houses that offer Chinese art and antiques in mainland China declined to 274. This is 18 fewer houses than in 2014, and marks the first time that the number of active houses in mainland China has declined in the last four years. 3. An interesting shift in price structure can be observed in mainland China in 2015. The lower-middle end (¥500k–1 million) of the market experienced a 45% decrease in volume, while the ultra-high end of the market (¥50 million and above) increased by more than 200%. A greater percentage of lots are being sold below ¥500,000, reaching 96.6% of the market, or the highest in five years. 4. Driven by an increase in demand, the overseas market for Chinese art reached a historic high in 2015, totaling $2.6 billion in sales and reaching a size more than half that of mainland China for the first time. 5. North America saw a 70% increase in the supply of Chinese art in 2015 year-on-year while the sell-through rate remained high at 61%, making it the largest market for Chinese art overseas in terms of volume. 6. The market share of Fine Chinese Paintings and Calligraphy in mainland China has declined to its lowest level in six years, both in terms of value (62%) and volume (43%), led by the continued market correction of the Modern and Contemporary Chinese Painting and Calligraphy sectors. Just as Christie’s was enjoying its highly successful £231.5 million sales of Impressionist, Modern and Contemporary art this month, changes were announced that suggest that a programme of acute cost-cutting, involving over 250 job losses, is under way. In Dubai, its annual October sale has been cut. In Amsterdam, the former Maritime Museum building it has owned since 1973 is to be sold, and a reduced schedule of auctions will be staged elsewhere. The future of its annual sale in Mumbai is in doubt. The biggest shock to English hearts is the planned closure of its much loved South Kensington branch (CSK) where it has successfully orchestrated its lower value sales in a broad number of categories for over 40 years. It was CSK’s roving valuation events that inspired the creation of the ever popular Antiques Roadshow. In its heyday, when England’s big houses were all selling their contents, pantechnicons would be parked almost permanently outside CSK. Sometimes it would hold as many as 15 sales in one week. One of the most memorable, if a little macabre, was the disposal of the collection of Britain’s most prolific hangman, Albert Pierrepoint, in 1998. CSK set the pace in many of these categories – film or ski posters for instance. The very wealthy, real collectors – Sheikh Saud Al Thani, Paul Getty or Lord Thomson for instance – would buy there, as well as all the dealers. But now the noose has tightened around CSK’s neck. Dealer Julian Hartnoll thinks CSK had become an anachronism because it couldn’t make the step from wholesaler, selling to the trade, to retailer. “Its death was inevitable,” he says. The beneficiaries, he says, will be Bonhams, and provincial auctioneers such as Bellmans in Sussex and Mallams in Oxfordshire which Christie’s tend to send lower value goods to anyway. Others could be Woolley & Wallis in Salisbury, Dominic Winter in Gloucestershire for books, Dreweatts of London and Newbury, and 25 Blythe Road and Roseberys in London. It will be interesting to see how it all divvies up. As Christie’s focused more and more on the potential gain at the top end of the retail market, sales at CSK were run down. Turnover figures fell from £139.4 million in 2012, when it held 126 sales, to just £62.1 million last year when it held only 55 sales. The emphasis now is on building up services in China and Los Angeles, where a new branch is scheduled to open, and investing in the internet, with online only sales replacing the live sales at CSK. “We are not withdrawing from London; or from different specialist areas – we are adapting for the future,” a spokesman said last week. “We have to look at the broader picture and compare the current art market statistics to the situation 10 years ago and assess that evolution. Ten years ago Europe and New York accounted for around 90 per cent of buyers; today Asia is at 30 per cent and the Middle East and West Coast America are increasing sharply; Europe and New York is now no more than probably 50 per cent. While it seems clear that Christie’s emphasis is increasingly high-end and Asia-orientated, the notion that the closures and redundancies are to fund improvements in online activity does not convince everyone. Online sales have risen rapidly, it is true, from $9.5 million in 2011 to $67 million in 2016. But that is still a tiny fraction of worldwide sales. Christie’s is still to see the pay-off for the $50 million it spent on improving online sales in 2014. Ironically, online activity is still focused on the lower end of the market, the same market in which CSK has excelled. And at those successful evening sales of Impressionist, Modern and Contemporary art there was not one bid over the internet either at Christie’s or Sotheby’s. Christie’s appears to be looking over its shoulder at Sotheby’s which is closing in on its leading sales total position, and with only 1,500 staff compared to Christie’s 2,200 worldwide. To a businessman like Francois Pinault, Chairman of the Board of Christie’s, that’s a good enough reason to make cuts. * This article first appeared on The Telegraph.